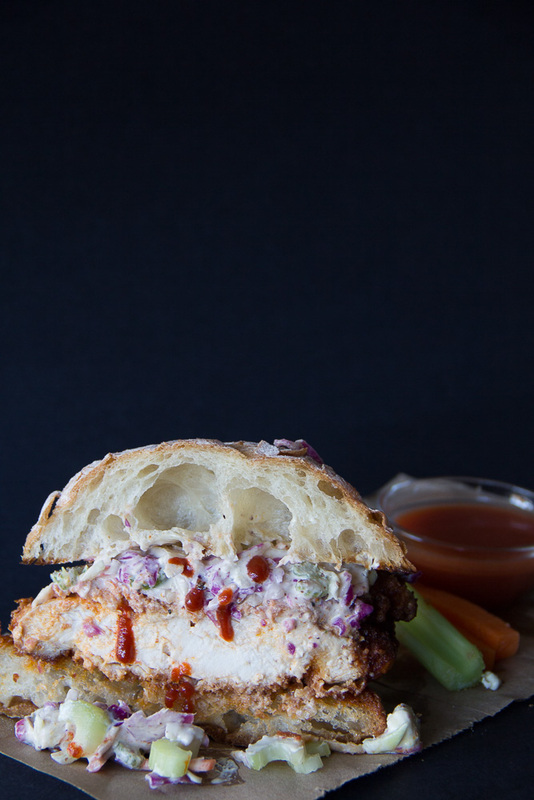 Where spicy, hot sauce meets the chill of a cool slaw all rolled into a yummy Buffalo Chicken Sandwich! Happy March 1st! I don’t know about you, but this year is just flying for me and the husband. I so glad that spring is almost here in just a few short weeks. It’s been a freezing winter so we’re ready for some warmer weather. I’m certainly looking forward to seeing that green stuff that we call grass as we haven’t seen it since say, November 21st. 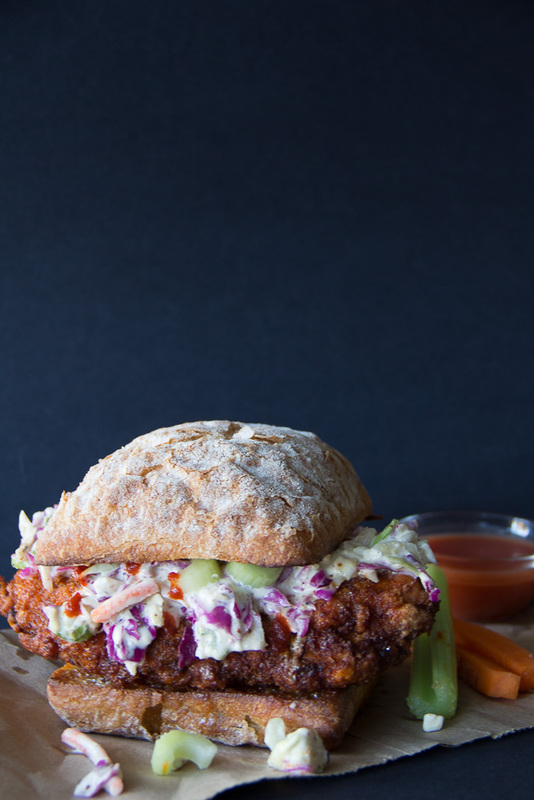 Anyhow, I’m happy to distract myself from the frigid temperatures with the creation of this spicy, hot Buffalo Chicken Sandwich with a Gorgonzola Slaw in honor of Sandwich Day! I love anything “buffaloed” if you will. I’m sure that’s not a real word by the way. I have a special place in my heart for anything spicy and this sandwich just does it for me. The crispy, panko breading gives me the right crunch and it’s pairing with the gorgonzola slaw soothes my taste buds just right. Hubby has an aversion to blue cheese but he actually enjoys gorgonzola due to its milder bite. I’m sure you’ll agree. First, let’s prep our four chicken breasts. Place your chicken breasts in a freezer bag and pound them with a meat mallet until they’re about a half inch thick. This will help them to fry evenly. Pour in 2 cups of buttermilk along with salt, white pepper and garlic powder. I like to marinate mine in the mixture overnight for the juiciest chicken ever. If you must eat them right away, you’ll need to at least let them soak up the buttermilk for a minimum of 2 hours. Now let’s make our slaw! You’ll need to mix 2 cups of shredded green cabbage, 2 cups of shredded red cabbage, one shredded carrot and one diced celery stalk. Add 1/2 cup of mayo, 2 T. of Dijon mustard, 1 T. whole grain mustard, 1 tsp. apple cider, 1/4 c. of crumbled gorgonzola, 1/8 tsp. salt and 1/8 tsp. pepper. Mix well, cover and place in the fridge for at least a couple hours. To make your buffalo sauce, melt 1/4 cup of butter with 1/2 cup of RedHot hot sauce and a tsp. of white vinegar. Keep warm. When you’re ready to fry, get your chicken breast coating assembly line ready. You’ll need three dishes for this. In your first dish, place 1 1/2 cups of all purpose flour. Your second dish will consist of 3 beaten whole eggs and your third will need 1 1/2 cups of panko breading. Panko honestly makes the crispiest fried anything. Yum! Start dipping your marinated breasts into the flour, then the eggs, and lastly the panko crumbs. Now you’re ready to fry! Fill a large skillet with enough canola oil to pan fry the breasts. I like to use canola oil as it has a higher smoke point than some other oil selections. Fry breasts over medium to medium high heat for 5 minutes on each side until cooked through to 165 degrees. Be sure not to overcrowd the pan and fry in batches if necessary. Remove to paper towel to soak up the excess oil. Now, take your four ciabatta rolls and spread each half with about a 1/2 tsp. of softened butter before grilling the inside surface to golden brown. I like to use these squares which provide a larger surface area to accommodate the pounded chicken breasts. However, feel free to use the bread roll of your choice. Now we’re ready to assemble. Dip each fried breast into your buffalo sauce mixture and place on the bottom half of the roll. Then top each breast with about a cup of the coleslaw mixture. Then place the top of the roll onto the coleslaw. I’m drooling! I just can’t get enough of this yummy sandwich. Say Grace and enjoy!! 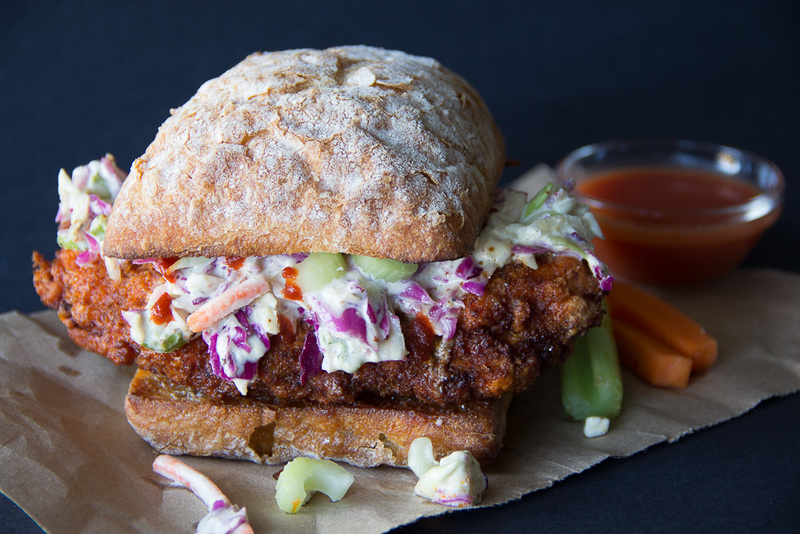 Where spicy, hot sauce meets the chill of a cool slaw all rolled into a yummy sandwich! Place chicken breasts in a freezer bag and pound them with a meat mallet until they're about a half inch thick. Pour in 2 cups of buttermilk along with ¼ tsp. salt, ¼ tsp. white pepper and ½ tsp. garlic powder. Marinate overnight or 2 hours minimum. Toss 2 cups of shredded green cabbage, 2 cups of shredded red cabbage, one shredded carrot and one diced celery stalk. Add ½ cup of mayo, 2 T. of Dijon mustard, 1 T. whole grain mustard, 1 tsp. apple cider, ¼ c. of crumbled gorgonzola, ⅛ tsp. salt and ⅛ tsp. pepper. Mix well, cover and place in the fridge for at least a couple hours. To make your buffalo sauce, melt ¼ cup of butter with ½ cup of RedHot hot sauce and a tsp. of white vinegar. Keep warm. Place 1½ cups of all purpose flour. 3 beaten whole eggs and 1½ cups of panko breading in three separate dishes. Dip marinated breasts into the flour, then the eggs, and lastly the panko crumbs. Fill a large skillet with enough canola oil to pan fry the breasts. Fry breasts over medium to medium high heat for 5 minutes on each side until cooked through to 165 degrees. Be sure not to overcrowd the pan and fry in batches if necessary. Remove to paper towel to soak up the excess oil. Take four ciabatta squares or roll of your choice and spread each half with about a ½ tsp. of softened butter before grilling the inside surface to golden brown. Dip each fried breast into your buffalo sauce mixture and place on the bottom half of the square roll. Then top each breast with about a cup of the coleslaw mixture. Then place the top of the square roll onto the coleslaw. Say Grace and enjoy! 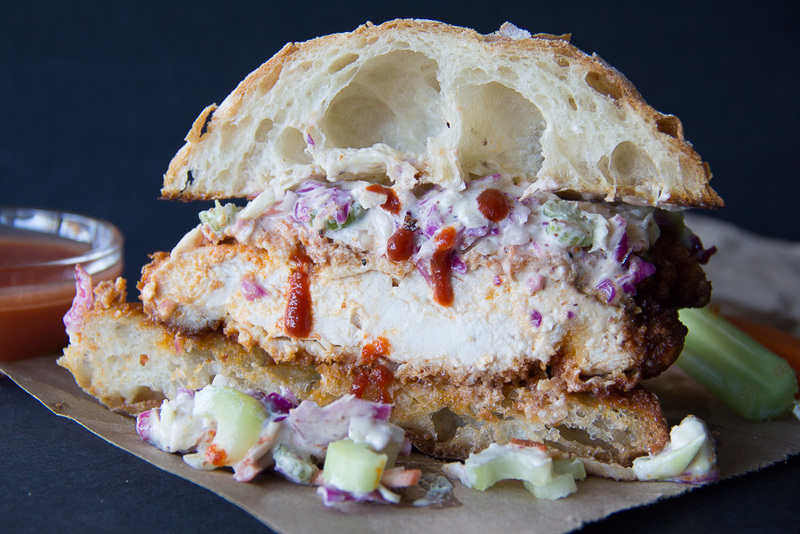 I’m all over this Buffalo-style chicken sandwich; your photos are beyond amazing and mouthwatering! Thanks Dan! It’s definitely a family favorite!! I love everything about this dish, except that I’m pescetarian so can’t eat it. I hate that part. Haha. Stunning photos, and just the sandwich itself is so. friggin. beautiful. Thanks Dana! So sorry you can’t partake in this pure deliciousness! I don’t know everything about a pescetarian way of eating, but why not substitute cod, halibut, or catfish in this sandwich; it would still be just as delicious. I agree, Kelly! Those would be awesome substitutes!! There’s nothing like spicy food to get you warmed up and your mind away from the winter weather. Looks absolutely delicious! OMG i have to try this asap! It looks amazing!! You know, Felesha – some of your stuff is really OUT THERE (in a good way). You’re so creative with combinations, and take awesome pics. This one is one I can see myself trying, and loving. The gang is ALL there! Buffalo chicken and blue cheese? Hello there!!! GREAT idea. Ha Ha! Just trying to keep your taste buds on their toes! Wait…that didn’t come out right! Well, you know what I mean. 🙂 Thanks so much Kylee!! 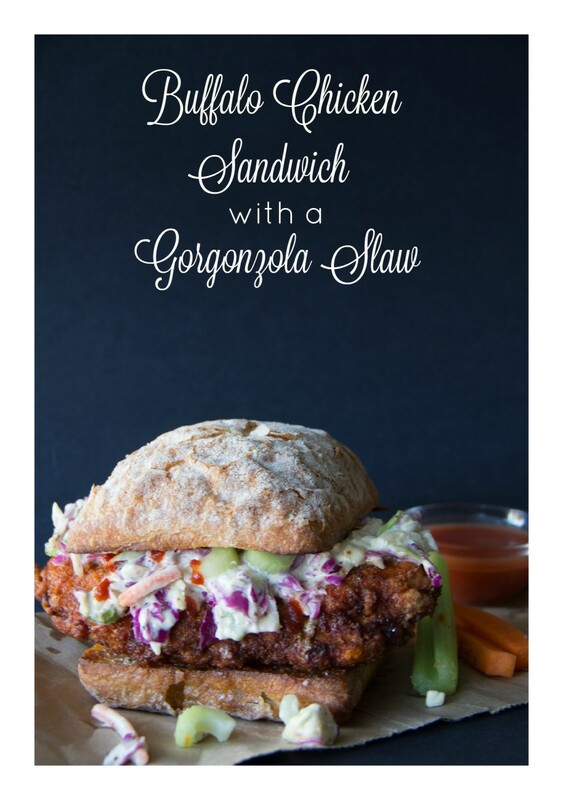 I ran across this recipe while looking for ideas for a gorgonzola chicken sandwich. I didn’t have time to do the whole shebang, but I whipped up the slaw, breaded the chicken with panko and fried it, and covered it with bottled buffalo sauce and it was fantastic! I can’t wait to make it again as instructed. 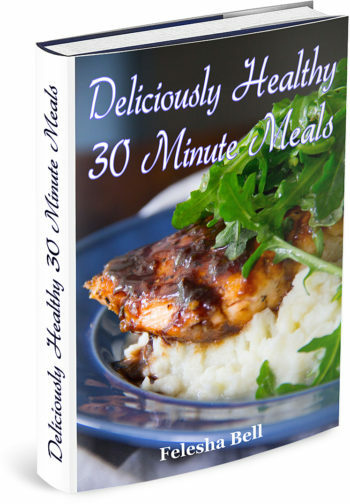 As good as it was with the short cuts, I bet the full recipe is amazing! Thanks! So glad you enjoyed this tasty sandwich, Missy!